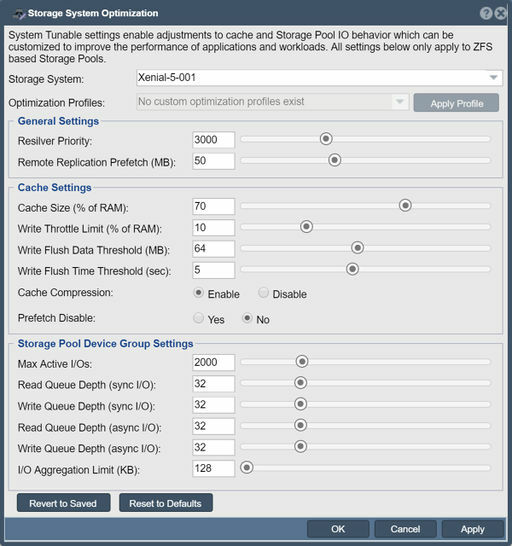 System Tunable settings enable adjustments to cache and Storage Pool IO behavior which can be customized to improve the performance of applications and workloads. All settings below only apply to ZFS based Storage Pools. All settings can be returned to default by pressing the 'Reset to Defaults' button. The 'Revert to Saved' button will refresh the settings to what is currently saved on the system. By hovering over the value fields additional information will be presented as a tooltip. This page was last modified on 6 February 2019, at 14:24.